CAN THE MOROCCAN APPROACH INSPIRE A DEVELOPMENT REVOLUTION? Decades of conflict and complex power dynamics between Jewish and Muslim communities have resulted in a deep-rooted aversion towards cultural engagement. This continues to hinder multiethnic relationships throughout the Middle Eastern and North African region. Even so, a rich history of ethnic and religious diversity remains an inseparable embodiment of the cultural atmosphere in Morocco. In the June 2018 issue of the Mediterranean Quarterly, Yossef Ben Meir discusses Morocco’s notable display of commitment towards peaceful coexistence, presenting promising outcomes for the kingdom. Concurrently, the question arises whether this Moroccan integration of cultural preservation and sustainable development is able to transcend borders across the Arab region. At the onset of the independence of Morocco, the country was home to the largest Jewish population in the Muslim world. The mellah, a Jewish quarter, in Marrakech emerged within the sixteenth century, a notable testament to the prominent Jewish identity instilled within early Moroccan history. This vibrant multicultural history is made evident by the approximately six hundred Hebrew “saints” that are buried at sites across Morocco, now recognized within the national preservation program. In a benevolent act of solidarity, the Moroccan Jewish community began to donate land to the High Atlas Foundation (HAF) in 2012 to plant organic fruit-tree nurseries for the benefit of Muslim farming families and schools. While impoverished families cannot afford to allocate the necessary two years to grow saplings from seeds, the Jewish community’s interfaith act helped to overcome this obstacle, initiating the House of Life project. Access to profitable resources on behalf of the land donation is intended to increase these communities visibility in the market, secure organic certification, and increase food security. Creating self-sustaining opportunities advances socioeconomic status and consequently leads to accessibility to resources, such as in education and health care, which can provide the means to counter the poverty trap. These human development outcomes are catalyzed in part from the Jewish communities’ act of interfaith through the donation of land. The multicultural component to the development approach contributes to the mutual respect and trust that builds between communities, which suggests greater sustainability of these projects. Cultural platforms deeply ingrain and perpetuate stereotypic content and false narratives about groups of people, which creates predispositions in our minds. The phenomena of prejudice and bias used to an extreme are detrimental to civilization and work against human endurance. Even when multiethnic groups are not engaged in explicit competition, imbalances in power and access to valued resources among various groups lead to perceptions of competitiveness. Both communities must be perceived as mutually contributive and valuable to reduce the inclination to feel vulnerably dependent on the other. Therefore, portraying out-groups as a beneficiary to the in-groups success can actually decrease prejudice and bias among the Jewish and Muslim communities because it can shift the out-group from a competitor to an ally. The High Atlas Foundation’s focus on cultivating mutual respect and appreciation of other groups gives a promising outlook towards the future of interfaith and sustainable development. However, in Ben-Meir’s essay, the evidence for the legitimacy of the Moroccan approach to development is largely limited to direct observation of only one organization’s fieldwork. Assessing outside efforts’ success or failure in human development would contribute to an expanded understanding of the factors that either facilitate or hinder efficient implementation. The essay makes note of Morocco’s potential to act as a positive model for fostering interfaith dialogue. For instance, the visit by Israelis and Palestinians to the nursery sites near the Jewish cemeteries in Morocco in recent years aimed to inspire individuals to implement these projects in their local communities across the region. Yet, there was no discussion in the essay of how the antecedent conditions in Morocco, that don’t necessarily exist elsewhere, may be fundamental towards its ability to implement projects efficiently. In the context of Israel and Palestine, we must acknowledge the only recent formation of the Jewish state that served to heighten the historically existing tensions in the region. Albeit the undeniable tensions that have endured between the Jewish and Muslim communities in Morocco, there is still an historical record and contemporary memory of peaceful coexistence. In addition, the intricate power dynamics plant distrust between members of the communities because of the vulnerabilities that arise within the Palestinian communities, who are denied equal access to the social, economic and political resources. Although sustainable development through an act of interfaith may already be implemented amidst the Israeli-Palestinian conflict, evidence of such projects would confirm the validity of the Moroccan approach. However, it is necessary to test and analyze what factors cultivate or hinder efficient implementation of human development integrated with interfaith. Then, efforts are able to knowledgeably create the suitable environment for community growth in different cultural contexts. Ultimately, human development is not occurring at levels suited to address the detrimental consequences of immense poverty and marginalization in Morocco. Therefore, investment in human development rooted in interculturalism is critical to transform the potential in impoverished communities into unbounded socio-economic success. The increasingly globalized world collectively benefits politically, socially and economically in an accepting and cooperative, rather than condemning, atmosphere. Therefore, investment in the Moroccan approach ought to be supported to grow, as it can build a powerful symbol within sites such as religious cemeteries that act as a sanctuary to nurture the conditions for a unified and more prosperous future. Julia Al-Akkad is an intern at the High Atlas Foundation in Marrakech, and a student at the University of Virginia studying Foreign Affairs and Middle Eastern Studies. 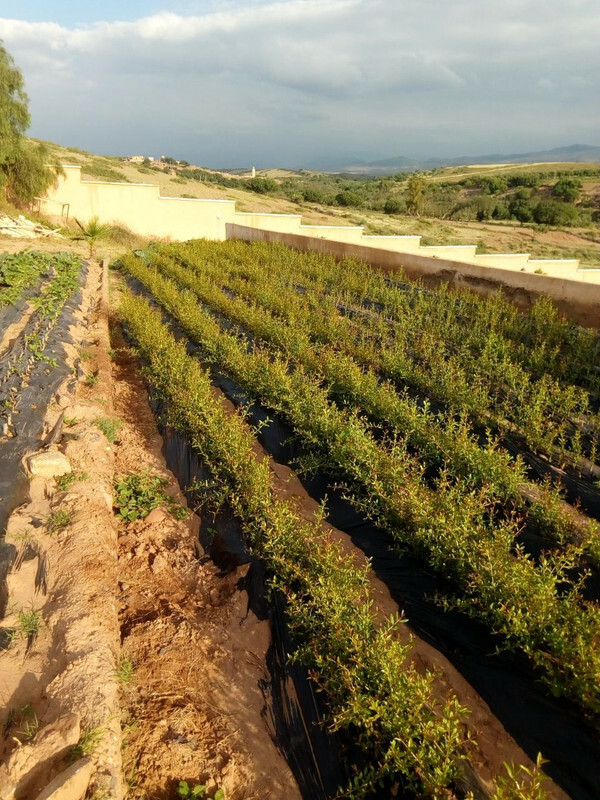 The organic fruit tree nursery at Akrich (Al Houaz province of Morocco) on land granted by the Moroccan Jewish community near the burial site of the Hebrew “saint” Raphael Hacohen (2018).